It is being reported that Pope Francis denied the existence of hell and said those unrepentance souls just disappear. The Pope does believe in hell but he ought to more careful who the hell he talks too and how he says things. 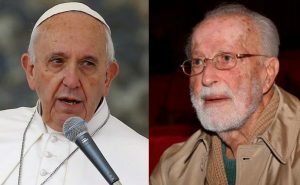 He met with an atheist journalist named Eugenio Scalfari who claimed it was an interview — and that in the “interview” the pope denied the existence of hell. The Vatican is scrambling to fix the mess and claims no interview was granted — it was just a discussion and that the Pope does indeed believe in hell. Why the Pope gets himself into these messes and why he is not more careful is a mystery to me. However, we have to realize the Pope often says things ambiguously which are then translated poorly. One could wish he would be more careful and not cause confusion and scandal. Unless, of course, that is his purpose. It seems unlikely however that the pope would deny the existence of hell especially since it is established doctrines in the Catholic Church. Here is an article that I think is pretty balanced and objective discussing most recent situation swirling around the Vatican this week. Jesus said that those who refuse to help others will be eternally punished. “Then he will answer them, saying, ‘Truly, I say to you, as you did not do it to one of the least of these, you did not do it to me.’ And these will go away into eternal punishment, but the righteous into eternal life” (Matthew 25:45–46). “The teaching of the Church affirms the existence of hell and its eternity. Immediately after death the souls of those who die in a state of mortal sin descend into hell, where they suffer the punishments of hell, “eternal fire.” The chief punishment of hell is eternal separation from God, in whom alone man can possess the life and happiness for which he was created and for which he longs” (CCC 1035).